So I am going to India. Next Thursday. For two months. Copy of the map is made (so we have identical maps map1 and map2). The copy (map2) is then saved and loaded again. It is checked whether map1 and map2 are still identical (they have same CRCs). One update run is simulated for both map1 and map2 and then CRCs are compared again. We have rather high hopes for this mechanism in finding determinism bugs. It should catch any bugs related to unitialized variables or logically corrupted game state. It will not find the cross architecture / operating system issues, but we have other mechanisms for this in place. So now we "just" need to write enough tests to cover problematic scenarios:) Already this mechanism lead us to find an error in Boost Binomial Heap implementation which we use in our Path Finder. I have been spending time making our multiplayer management code (connecting, synchronizing, map sharing logic, etc.) testable as well. This is great because now we can just fire up 3 virtual clients in the test, simulate their behavior and see what the results are. Before, this has been done manually (running multiple game instances) and it was slow, error prone and not easily reproducible. Also some of the edge cases were virtually impossible to simulate. Multiplayer tests led us already to finding and fixing the issue with desync / crash when multiple people would connect to the game at the same time. The good news is that we had a guy from Romania called Robert here with us last week to work on the game. We were really happy with what he has done and he seemed to enjoy working on the game with us. The result is that we made him an offer and he agreed to come to Prague to work on Factorio full time starting February 2015. During our hiring "process" we would often spent quite a bit of time in skype interviews leading nowhere. As a result we started using codility recently to let people show off their code-crafting skills on our selected c++ coding test. Moving into the new office has had a great advantage of reconciling our "graphical department". Our artists Albert and Pavel are now sitting in the same room which makes their communication and working process overall way smoother. Albert has been using Blender to create all the 3D assets (which are then rendered into sprites used by the game). It is a great tool but it is a bit tricky to find artists with active Blender working experience. Pavel has most experience with Cinema4D but he agreed to switch to Blender in order to keep the project assets consistent. It makes the workflow much easier if those guys can easily share the models, textures and also the know-how. So Pavel is diving into the depths of Blender these days. 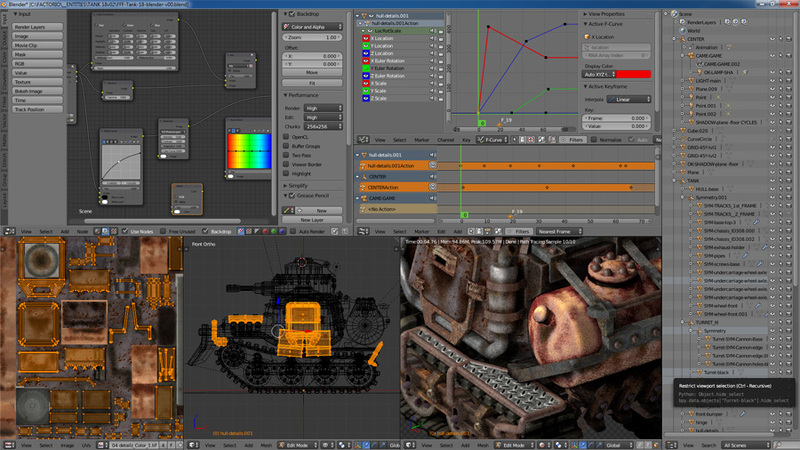 One of the things he has been doing is migrating the tank (which has been done in Cinema4D originally) to Blender. The tank will probably get a cooler color mask in the process. Below you can see the screenshot from the process. As always the thread for comments is ready.